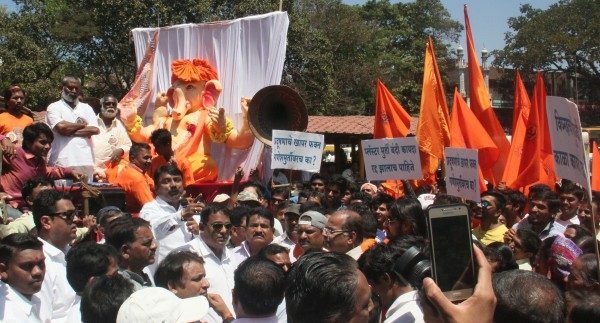 Various members of the Ganesh Mandals, Idol makers, MLAs Sambhaji L. Patil and Sanjay B. Patil and former MLA Abhay Patil took out a procession against the ban on Plaster of Paris (PoP)-made idols of Lord Ganesh. They demonstrated at the DC office demanding the withdraw of ban. Karnataka State Pollution Control Board has already issued orders banning use of PoP for Ganesha idols. The protesters said Belagavi had a large number of Ganesh Mandals and it is a very big festival celebrated in this part of the state which attracts many visitors. Big idols making out of clay is difficult, the idol makers said. The State government should withdraw the ban and allow the use of PoP, they added. A memorandum was submitted to the deputy commissioner. Leaders need to lead us on the path to being environmentally friendly not destroy nature. Sad! Congress of Karnataka is not having proper plan to develop the namma Belagavi as SMART. simply digging unnessesary things to distoy the namma Belagavi people peace. Let the big ganesh idols which are placed in mandals be made from pop and the small ganesh idols which are placed at home be made from clay……..! For everyone’s kind info, In Belgaum we immerse the Ganesh Idol’s in Corporations Man Made Pounds Like Kapileshwar Pounds, Jakkin Honda, Or Killa pound, That water is not a floating water, and never be used for drinking purpose. 2nd thing Carporation fills the pounds before Ganesh Utsav, and empty the pounds after the Ganesh immersion so no where pollution is happening. Don’t worry about It, all the Belgaumites are takin care of pollution. 3rd one why only on Big Ganesh Idol’s…?? There are many things which polluting the water and air…?? Stop those pollutions first. Ganapati will be there only for 11 days, We can see the air pollution water pollution almost everyday, 365 days in year. Holi Water pollutions, Ganapati Water pollutions, Deewali Noise and Air Pollutions, Shivratri Milk Pollution, Sankranti Water pollution, Arre what the he’ll is happening here…?? Only Hindu festivals making pollutions and you banning the Hindu festivals, it’s a attack on Hindus Culture, Its attack on Hinduism, Its a Political Game against Hindus, By Anti Hindu Congress of Karnataka. If they allow such things may be in future they can protest to withdraw ban on plastic. Then What? its a good move my KSPCB. We should support it. BAN POP IDOLS. When will the society of Belgaum show their maturity and respect the need of the hour. It is high time we start thinking of the nature before we destroy the natural rights of future generation. Stop all this & get smart when we are looking Belgaum to become a smart city. Without smart minds, city will never become smart. Environment concerns are valid and time we all learn to live with nature rather than against nature. I am sure creative ways can be used to build large idols in an eco-friendly manner. We are mere guests on the planet and have an obligation to future generations to bequeath a livable planet.